I’M THE EASIEST GUY to buy for at Christmas. Give me a good knot book and I can stay busy, content even, until Valentine’s Day, maybe Easter. So when fishing illustrator Joe Mahler told me he’d just completed work on an illustrated knot book, well, I was excited for him … and for me. 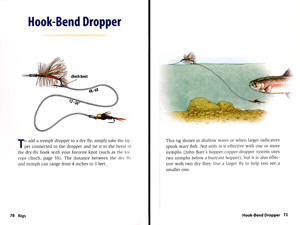 Mahler’s new book, Essential Trout Knots & Rigs, is a top-shelf, lovingly and beautifully illustrated primer for those of us who love to fish with a fly. And it’s published by Headwaters/Stackpole Books, the trusted name in fly fishing tomes. Despite the title designation ‘For Trout,’ many of the leader and terminal ties are effective and efficient for small to medium saltwater species, too. Essential Knots is intelligently partitioned into seven sections. 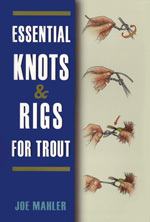 It begins with knots for attaching backing to fly reel and runs logically through the full fly-fishing system, with a couple of chapters at the end dedicated to multi-hook rigs and strike indicators. What sets this book apart from the lower-order knot books is Mahler’s choice to include knots like the 16-20 Knot (a.k.a. Pitzen), Seaguar, Orvis/Becker, and the Eugene Bend, none of which are your everyday knot-book fare. But these are all knots I’ve used and now champion. Of particular interest to me is Mahler’s chapter on leaders, and the art and info depicting multi-fly rigs, which will can benefit fishers of waters both sweet and saline. Simple, clearly written descriptions accompany the artwork, but Mahler’s visuals are so expertly and vividly rendered that the written is almost unnecessary. And that’s a good thing, since trying to follow written directions from a knot book is confusing, like trying to follow driving directions from a slow talker. You’ve seen Joe Mahler’s illustrations in most all the good fishing publications recently and you’ll see much of his work in Jon Cave’s new casting book, due out late this year. Pick up Mahler’s book and you’ll see why the magazines love his illustrations — they’re exceptional and accessible, just like his new book.